How to fix “Windows has detected an IP address conflict” error on Windows? 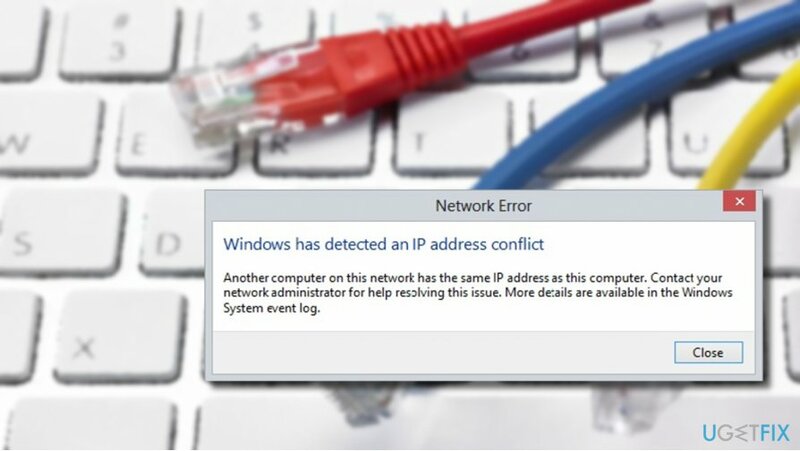 Home »	Fix » How to fix “Windows has detected an IP address conflict” error on Windows? Issue: How to fix “Windows has detected an IP address conflict” error on Windows? Hello. A couple of days ago I’ve started receiving an error, which claims that “IP address conflict Network Error – Another computer on this network has the same IP address as this computer.” I understand that the problem is related to the Internet connection, but since I’m not tech-savvy, I have no idea what should I do to fix that. I use Windows 10 1703, which is connected to the Internet using Ethernet port if that makes sense. Thanks in advance! “Windows has detected an IP address conflict” is an Internet connection error, which strikes PCs and laptops, which are connected to the Internet using Ethernet cable. Since now, none of the Windows users who use Wi-Fi router contacted us or reported about this issue on IT forums and, actually, they should not face this problem. The “Windows has detected an IP address conflict” error occurs only if people are using one Ethernet cable to connect one or several devices. OR press Windows key + R, type cmd, and press Enter. Copy and paste the ipconfig /all command. When the Physical Address opens, open the second PC. Press Windows key + R, type ncpa.cpl, and press Enter. Right-click on the Ethernet [number] and open Properties. Select Configure and then open Advanced. Click on Network Address and enter the MAC address in the Value box.